Rachel Von | The Journal Gazette The Komets' Cody Sol, right, gets checked against the glass by the Fuel's Andrew Schmit during the first period Wednesday at the Coliseum. 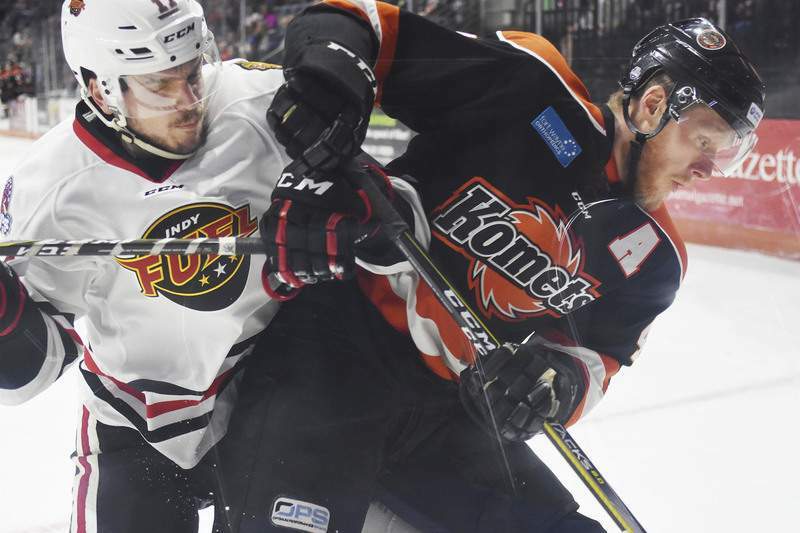 With their 4-2 victory tonight over the Indy Fuel, the Komets have pulled within one point of the Toledo Walleye for the Central Division lead. And the Komets have played one fewer game than Toledo. But the Komets are trying not to pay any attention to the standings. And that’s probably wise. Despite being on a 12-1-1 run, the Komets have made up only two points on the Walleye. “We don’t really talk about it too much,” said defenseman Jason Binkley, whose Komets play Friday at Wheeling, West Virginia. “We have a standings board up in the room, and we know where Toledo is, and we know there are guys behind us, but at this rate we’ve just got to keep winning and controlling our own destiny. Speaking of Toledo, though, in case you missed it, former Komets forward Garrett Klotz got suspended eight games by the ECHL for his part in the line brawl between his current team, Kansas City, and the Walleye on Saturday. Klotz repeatedly cross-checked A.J. Jenks, in an incident very similar to Kalamazoo’s Ben Wilson going after Simon Denis during the playoffs last season. Eight games does seem a little light, especially considering Wilson got 20, but Denis also suffered a major injury in the fracas. All that being said, what Wilson and Klotz did were deplorable and really should be come down on hard by the league. So, too, should hits like the one we saw Reed Steckel put on Justin Hodgman tonight at Memorial Coliseum.